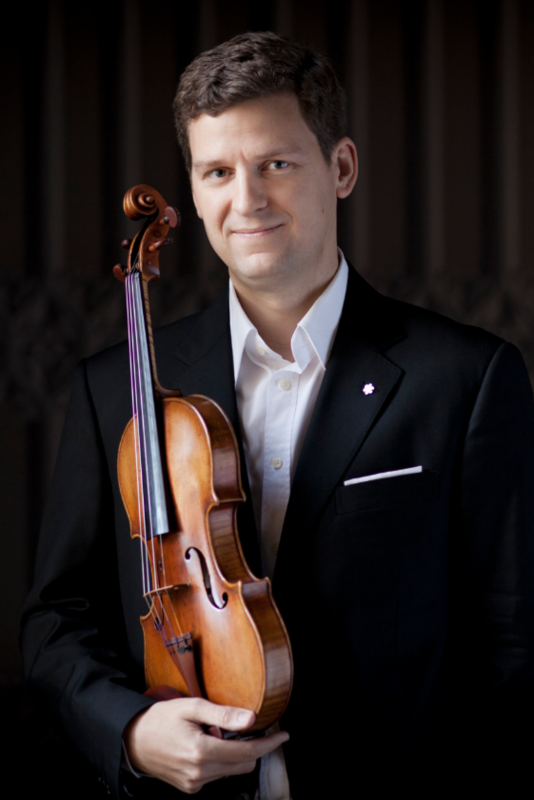 James Ehnes has established himself as one of the most sought-after violinists on the international stage. Gifted with a rare combination of stunning virtuosity, serene lyricism, and an unfaltering musicality, Ehnes is a favorite guest of many of the world’s most respected conductors including Ashkenazy, Alsop, Sir Andrew Davis, Denève, Elder, Ivan Fischer, Gardner, Paavo Järvi, Mena, Noseda, Robertson and Runnicles. Ehnes’s long list of orchestras includes, amongst others, the Boston, Chicago, London, NHK and Vienna Symphony Orchestras, the Los Angeles, New York, Munich and Czech Philharmonic Orchestras, and the Cleveland, Philadelphia, Philharmonia and DSO Berlin orchestras. Ehnes has an extensive discography and has won many awards for his recordings, including a Grammy Award (2019) for his live recording of Aaron Jay Kernis’ Violin Concerto with the Seattle Symphony and Ludovic Morlot, and a Gramophone Award for his live recording of the Elgar Concerto with the Philharmonia Orchestra and Sir Andrew Davis. His recording of the Korngold, Barber and Walton violin concertos won a Grammy Award for ‘Best Instrumental Soloist Performance’ and a JUNO award for ‘Best Classical Album of the Year’. His recording of the Paganini Caprices earned him universal praise, with Diapason writing of the disc, “Ehnes confirms the predictions of Erick Friedman, eminent student of Heifetz: ‘there is only one like him born every hundred years’.” Ehnes’s recent recording of the Bartók Concerti was nominated for a Gramophone Award in the Concerto category. Recent releases include sonatas by Beethoven, Debussy, Elgar and Respighi, and concertos by Britten, Shostakovich, Prokofiev, and Walton, as well as the Beethoven Violin Concerto with the Royal Liverpool Philharmonic Orchestra and Andrew Manze, which was released in October 2017 (Onyx Classics).